IT’S MORE THAN HEIGHT – IT’S HEALTH! KUALA LUMPUR: Novo Nordisk Pharma (M) Sdn. Bhd. 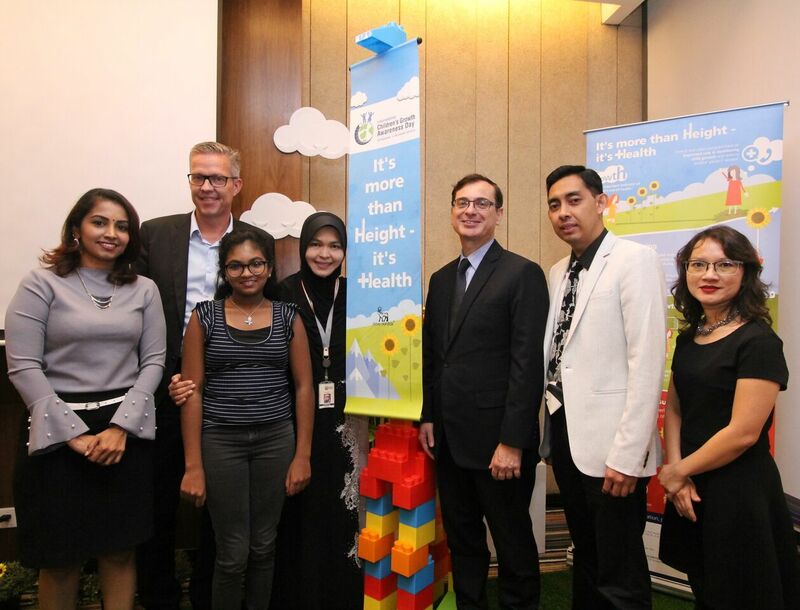 (Novo Nordisk) launched ‘It’s More Than Height – It’s Health Awareness Campaign’ to drive greater understanding on Growth Disorders in children and the potential impact on their health. This campaign which highlights the need to monitor growth patterns in their early years also coincides with the International Children’s Growth Awareness Day which takes place each year on 20th September. It is every parent’s desire that their children grow healthy, tall and smart. Parents will provide the best possible nutrition, care and opportunities to nurture this growth. What if, despite all their best efforts, their child does not grow to the appropriate height for their given age? Parents often take a ‘wait and see’ approach. They may attribute their child’s short stature to familial, hereditary or genetic factors or assume that their child will ultimately catch-up with his or her peers. What if that does not happen? Is time running out for their child’s growth? The fact is, there is a ‘growth time span’ for children. Largely, not many are aware that poor growth can indicate a serious underlying health condition in some children. Thus, it’s crucial for parents to monitor if their children are growing normally. Once growth has optimised, short stature children must go through life with the outcomes that impact their overall health and also affect them socially and psychologically. Present at the Campaign launch was Associate Professor Dr. Muhammad Yazid Jalaludin, Consultant Paediatrician and Consultant Paediatric Endocrinologist, Head of Department of Paediatrics, Faculty of Medicine, University Malaya Medical Centre (UMMC). He urged parents to consult their paediatrician to conduct baseline measurements and history-taking to rule out other factors. If a hormone issue is suspected, the child should then be referred to a paediatric endocrinologist. Baseline blood investigation and stimulation tests can be conducted to assess if slow growth is actually due to growth hormone deficiency. Growth hormones are a type of protein made by the pituitary (a small gland located below the brain in the center of the head behind the nose). It stimulates height growth in children and adolescents and contributes to other important bodily functions such as maintaining muscle and bone mass, decreasing fat tissues, influencing blood lipid levels such as cholesterol and triglycerides. Besides Growth Hormone Disorder or GHD (distinguished by abnormally short height due to the lack of growth hormone), among other disorders that can also cause short stature in children are Turner Syndrome (chromosomal condition that affects development in females where the most common feature is short stature, which is evident by about age 5) and Small for Gestational Age or SGA (where a fetus or an infant is smaller or less developed than normal for the baby’s gender and gestational age). Lending an equally important perspective to the issue of growth disorders, Associate Professor Dr. Firdaus Mukhtar, Consultant Clinical Psychologist, Head of Department of Psychiatry, Faculty of Medicine and Health Science, University Putra Malaysia (UPM), reiterated that healthcare professionals, caregivers and educators need to pay special attention to the psychological, emotional and physical well-being of short stature children. It is important to provide a supportive and nurturing environment to ensure stability as they go through the medical routines. “Beyond health issues, short stature children may also experience a lower quality of life compared to their peers. They could be subject to teasing and/or bullying at school, have lower self-esteem and face physical and social challenges1. Thus, parents must be proactive in monitoring the growth of their children. If necessary, seek appropriate treatment at the earliest stage. Give your children the best start to realise their potential in life,” she said. Ultimately, short stature children will not grow or ‘catch-up’ in height later in their development phase. To ‘wait and see’ until children are in their early teens minimises the timeframe available to address any growth issues as their bones will start to close (epiphyseal fusion) upon entering puberty. Thus, the onus is on parents to refer to a paediatrician as early as possible. With early diagnosis and treatment growth hormone deficiency can be treated to optimise good health and help children attain normal adult height.